It seems the most significant thing in Finland's Silentrain's short history is a series of name changes. They began as The Sanitarium, a good metal name. However, this was taken, so they changed to Dunces in 2001, releasing several works over the next seven years. I hope Dunces means something cool in Finnish, because in English the word 'morons' could easily be substituted. Later, after signing with Stay Heavy Records, they saw that 'Dunces' didn't fit them or their music (no kidding, duh! ), so they changed to Silentrain. Wise move. Now, with a new name, comes their debut work, 'Wrong Way To Salvation.' Yet, the question still remains, as it does for all Scandi metal, can Silentrain bring anything new? The simple answer is, apparently not. 'Wrong Way To Salvation' is pretty standard melodic heavy and power metal. If there is an edge to Silentrain's music it's probably in the better than average song composition and production, strong vocal performance and subtle use of layered keyboards. Otherwise, Silentrain seems content to emphasize riffs and riffing above all else as on 'No More' and 'Until You Break' among others. Don't look for much fret brilliance here. However, when it is delivered it can be very good as on 'Broken,' 'Ride With The Devil' or the title track where it's very short, but pleasing. Silentrain also messes with dirty vocals throughout, mostly as accent. It works on 'No More,' but most collapses into itself as on 'The Road Of Destiny.' Generally, if you can't do it well, dirty vocals should either be left to the black and death metal bands (most of whom can't sing or play anyway) or not be used at all. Silentrain's 'Wrong Way Of Salvation' has some intriguing moments on the aforementioned title track and 'Broken,' but also on 'Ride With The Devil' and possibly 'Slayer.' However, as much as I found this work interesting, I still found myself unconvinced that there is something new here that will stick and make a difference in Finnish metal. Possibly, with the sophomore release, Silentrain will break free of their boundaries. 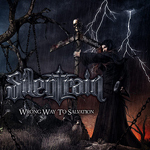 Silentrain's 'Wrong Way Of Salvation' has some intriguing moments as found on a few songs including the title track, 'Broken,' 'Ride With The Devil' and possibly 'Slayer.' However, as much as I found this work interesting, I still found myself unconvinced that there is something new here that will stick and make a difference in Finnish metal.